The body of the lady Elaine is in the ferry crossing the river styx; I can’t tell whether she has coins on her eyes or whether the ferryman as taken them. There’s a garland of flowers alongside the ferry. This is a case where the engraving, in black and white, seems much stronger than the oil painting, now in the Chicago Museum of Art. “Farewell, sweet sister,” parted all in tears. But fast asleep, and lay as tho’ she smiled.—Tennyson. Note.—This picture is owned by Mrs. Johnson, of San Francisco. 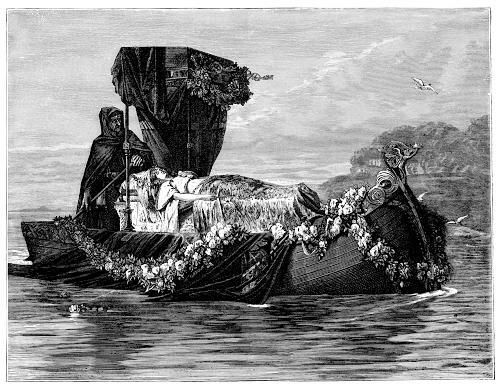 Tennyson wrote the poem Elaine in 1859, expanding on his earlier poem The Lady of Shalott, but followed more closely the narrative of Sir Thomas Malory. Elaine, in that account, is drifting down the River Thames. In the story (and the poem) Elaine had pined away for the love of the chaste knight Sir Lancelot of the Round Table of King Arthur.